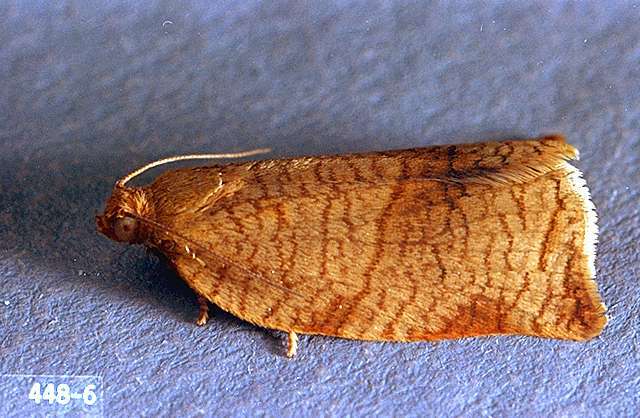 Pest description and crop damage Adult moths are 0.5 to 0.75 inch long, dark brown, with darker transverse lines on the forewings. The larvae are green with a light to dark brown head. Damage begins early in spring and includes rolling of leaves as well as feeding on foliage and buds. There is one generation each season. 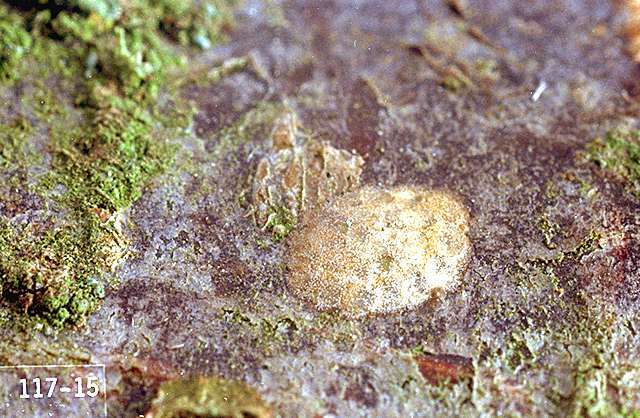 Biology and life history This leafroller overwinters as eggs laid on the bark or limbs in irregular flat masses which appear grayish by spring. Eggs hatch in spring as buds are opening until petal fall. 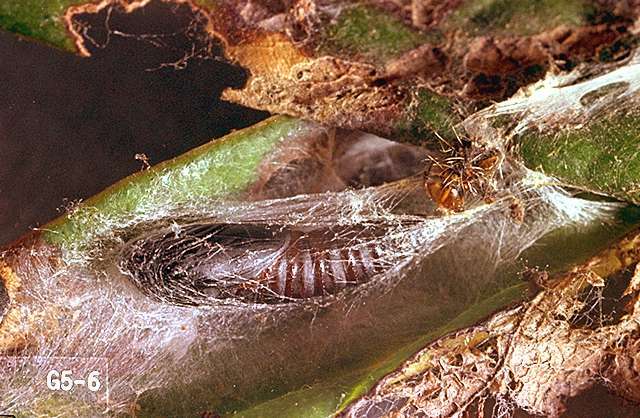 The larvae feed for 4 to 6 weeks, then pupate in the rolled leaves and emerge as moths in early summer. The overwintering eggs are laid on twigs and branches in July. Pest monitoring Start checking for larvae around mid-March by inspecting three terminals per tree and three leaf clusters per terminal. Each terminal is a sampling unit. The terminal clusters should be examined for tightly rolled leaves and feeding damage on new growth. Check for adults by using one pheromone trap for each 5 acres, placed 6 ft high in the tree canopy starting in mid-May. Treat for larvae when infestation level is 20 to 25%. Treat for adults when catch is 40 moths per week. Very low temperatures in winter significantly reduce overwintering populations of larvae. Spiders and parasitic wasps, as well as predators like the brown lacewing, greatly reduce leafroller populations throughout the year. Typically, biological control is sufficient to manage leafrollers and chemical control is rarely necessary. 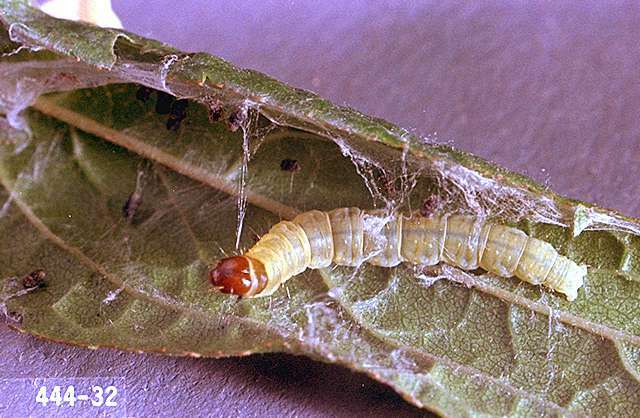 Home orchardists: Hand-pick rolled leaves containing larvae or pupae. Make spray or dust application in spring after overwintering eggs hatch, about the time leaves are about 0.75 to 1 inch. Control is more effective if pesticide is applied when worms are small. bifenthrin (Brigade WSB, other generics) at 0.05 to 0.2 lb ai/a. PHI 7 days. REI 12 hr. chlorpyrifos/gamma-cyhalothrin (Cobalt) at 6.5 to 14.2 oz/100 gal (26 to 57 fl oz/a) PHI 14 days. REI 1 day. Do not make more than 3 applications per season of Cobalt or other product containing chlorpyrifos for hazelnuts. diazinon (Diazinon AG 500) at 1 pint/250 to 400 gal water/a. One application per season. PHI 45 days. REI 18 days. WA and OR only. emamectin benzoate (Proclaim) at 3.2 to 4.8 oz/a. PHI 14 days. REI 12 hr. methoxyfenozide (Intrepid 2F) at 8 to 16 fl oz/a. PHI 14 days. REI 4 hr. For control of foliar feeding leafroller larvae, apply when larvae are feeding. Most effective crop protection results from application made at the initiation of egg hatch. Do not apply more than 24 fl oz/a per application or 64 fl oz/a (1 lb ai) per season. Do not apply within 25 ft of an aquatic habitat, 150 ft if applied by air. Ambush 25W at 12.8 to 25.6 oz/a. PHI 14 days. REI 12 hr. Do not graze treated orchards. Extremely toxic to fish and aquatic habitat. spinetoram (Delegate WG) at 1.1 to 1.75 oz/100 gal water (4.5 to 7 oz/a). PHI 14 days. Apply no less than one week apart, with a maximum of 28 oz/per year. spinosad (Success 2L, Entrust SC) at 4 to 10 fl oz/a. PHI 1 day. REI 4 hr. Do not apply more than 29 fl oz/a per year. Entrust SC is OMRI-listed for organic use.